Posts tagged with "commercial waterproofing Tampa FL"
Shield Coatings & Weatherproofing specializes in corporate weatherproofing. The company has been working with business building owners on designing weatherproofing systems since 1974. They have partnered with many satisfied corporate clients throughout Central Florida. Join a growing list of prominent clients when you opt for commercial waterproofing in Tampa, FL. Inconceivable damage can quickly occur in a building even when it starts with an imperceptible leak. From skyscrapers to churches to historic landmark buildings, it pays to have comprehensive waterproofing services performed after buildings are constructed. Save money by avoiding costly damage. Gain peace of mind. Protect Assets. These are a few of the advantages gained when a building is prevented from leaks, excess moisture, and cracked foundations. Another important benefit of waterproof barrier applications and blocking off all leak points is to prevent health hazards. Mold and mildew multiply exponentially in moist areas. Keep out mold spores that may be harmful to your clients, guests, and employees with respiratory ailments. Choose a company that is known for providing comprehensive work on business buildings in many different shapes and sizes. Prevent weather-related damage as much as possible with the crews who cover leak points from roofs to foundations, including walls and windows. Contact Shield Coatings & Weatherproofing at (813) 247-5421 for more information on waterproofing in Tampa. This entry was posted in Uncategorized and tagged commercial waterproofing Tampa FL on August 4, 2017 . If you own a large corporation, one of your main concerns should be the status and longevity of your office building. 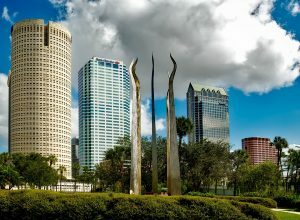 Large sky scrapers and other corporate venues need to be properly maintained in order to protect your employees, business assets, and data. Shield Coatings & Weatherproofing provides exceptional commercial waterproofing in Tampa, FL so you can ensure your business stays safe, especially during hurricane season. Waterproofing your building has a variety of advantages. As a business owner, your primary goal is to continue bringing in money. When your building and its contents become damaged from water, it leaves you with a large amount of repair and replacement costs. When you waterproof your corporation, you can avoid these additional costs and continue focusing on bringing in revenue than losing it. Having your building waterproofed also strengthens the foundation, which can be extremely important when you own a tall, heavy building. Having the basement layer of your building waterproofed prevents it from deteriorating from the bottom up with mold, mildew, and water damage. Waterproofing your business will help you avoid costly repairs and strengthen the foundation of your building. Ensuring that your building is protected against the wild Florida weather means that all aspects of your company will remain unharmed when the storms blow over. For more information on how you can benefit from commercial waterproofing in Tampa, FL, call Shield Coatings & Weatherproofing today at (818) 247-5421. This entry was posted in Uncategorized and tagged commercial waterproofing Tampa FL on July 5, 2017 . © 2019 Shield Coatings & Weatherproofing, Inc. All Rights Reserved.